Lang Son is a mountainous Northern Province bordering China on its north-east. 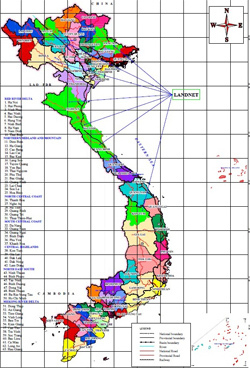 This province is the a poor and a highly deforested province in Vietnam, with 85% of the population being ethnic minorities (Tay, Dzao, Nung San, Chi, San Diu, Hoa). Huu lung is a district located in the southern part of the Lang Son, with a total natural area of 80,538 hectares of which over 80% is classified as forest land. Since 1975 Huu Lung has been a strategic area for State Forest Enterprises (SFEs) for timber exploitation. As a consequence of large scale industrial tree plantations (mainly eucalyptus), 70% of what used to be primary forest has been severely degraded and exhausted. In addition, poor implementation of various forest (re)allocation and reforestation programmes resulted in huge inequalities in forest allocation, overlapping boundaries, unclear benefit sharing arrangements and persisting forest conflicts between people and SFE’s. CIRUM entered Minh Son commune of Huu Lung in 2007 the midst of this ambiguous situation. After a considerable period of building relations and cooperation with local people and authorities, for instance on small scale forestry and livelihood initiatives, we moved our activities towards forest conflict resolution and reclaiming forests from the SFE. In 2011 we continued our efforts in Huulung in the project “Assuring the community rights of poor and the ethnic minority people in approaching, managing and effectively using forest and forestland resources” with financial support from the Interchurch Organization for Development Cooperation (ICCO).Similar activities have also been carried out in Hoa Son commune. Sofar we achieved some positive results such as supporting local people and authorities to reclaim forests from SFE and its reallocation to community and community mobilization and awareness raising activities for forest regeneration and protection. A special feature in this project that distinguishes it from previous ones is that it is part of a larger programme carried out in a coalition of CIRUM, CRD, RDPR, CODE and SPERI. These are other Vietnamese NGO’s working in similar fields and in this coalition, these organisations are joining forces in common activities like exchange study tours, joint research , workshops and joint lobby and advocacy. Currently our lobby efforts are focus on State Forest Enterprise reforms, forest land reallocation to people and Land Law revision in 2013.